3 lenses per box @ $21.86 per box. Minimum order 4 boxes (six months' supply). 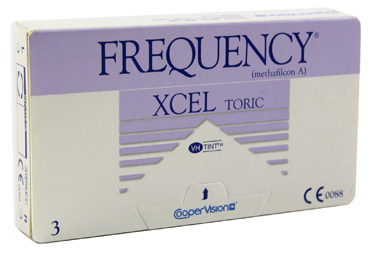 The popular Frequency family's monthly toric lens, the Frequency XCEL Toric is made from a polymer whose high deposit-resistance allows it to be worn comfortably all day long (protein build-up often being the cause of gradual discomfort over a day's wear). Additionally its advanced back surface design brings first class visual acuity even in adverse lighting conditions.